How do you use this word if you use it ? 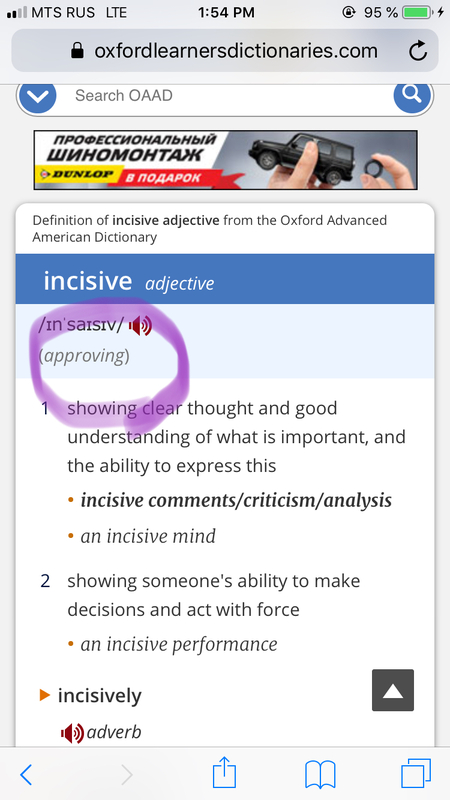 I was reading a book which provided the translation of this word as (I will write the word which is an exact equivalent of it) CUTTING OR BITING According to the translation of this word, INCISIVE means unkind and likely to hurt someone’s feelings. But what I found in the dictionary (actually ,I looked the word up in several online dictionaries) was that: ‘think and express ideas clearly , be logical ,show a good understanding of what is important and have an acute mind.’ I am completely puzzled Does this word really have a negative meaning ? Cause I am very sure of the opposite. If the pictures I pinned show up, you’ll be able to see the meaning yourselves. 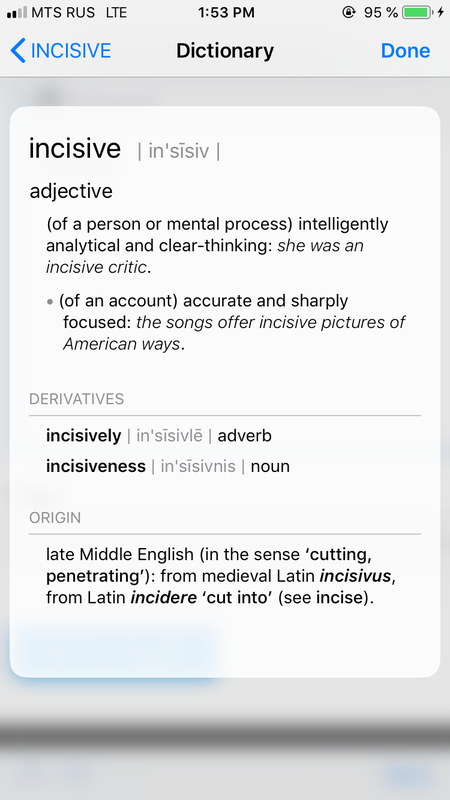 As your definitions show, incisive means 'cutting'. The apparent difference in usage is down to "what is doing the cutting" and "what is being cut". Being cut hurts, so an incisive remark is designed to hurt someone. An incisive mind, however, is one which cuts through problems. That is a good thing. Not the answer you're looking for? Browse other questions tagged vocabulary or ask your own question. How would one use the word preposition? Should I use 10 cent words or $2 words? How to use the word “piquant”? Should I use the word “raise” or “grow” for animals?